Sauté veg and spices in oil until fragrant. Add the lentils and liquid . 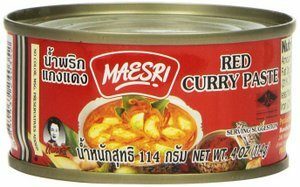 In a large pot over medium heat, add the oil, garlic, ginger, lemon grass and Thai red curry paste. Fry for 5 minutes, until fragrant. Add the veggie broth, water, fish sauce, and coconut milk. Bring to a boil, simmer for 15 min. After 5 min add noodles and cook till tender (8-10 min.) taste the broth for salt and adjust seasoning accordingly. divide among serving bowls, add a squeeze of lime juice and your garnishes, and serve. For the Samosa Dough: In a large bowl sift together the flour and salt. Add the oil and gently rub into the flour mixture until flaky dough starts to form and the oil is completely coated in the flour mixture. Begin adding the water and mix to combine until a stiff dough forms. Knead for 5 minutes until the dough is shiny and elastic but not wet and sticky. Cover with plastic and allow to sit at room temperature for 30 minutes. Divide the dough into 8 balls. Roll each ball of dough out into a 6-inch circle then cut in half. Brush the straight edge with water, fold it in half, and align the two straight sides so they overlap to form a cone shape. Pinch the edges together to make a tight seal. Place some of the filling inside each cone, leaving the top edge clean. Moisten the inside top rim of the cone and press the edges together to make another tight seal. 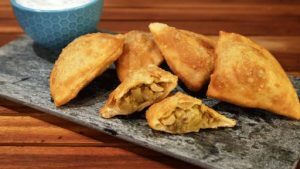 Place the samosas on a tray until ready to fry. Repeat with the remaining dough and filling. In a large Dutch oven, heat the frying oil to 360ºF. Line a plate or baking sheet with paper towels. Place the samosas in the Dutch oven and fry until golden brown, about 2-3 minutes. For the Cauliflower Filling: In a medium saucepan over medium heat, boil the potatoes until just tender, about 10-12 minutes. When cooled, cut the potatoes into a small dice and set aside. Preheat a large saute pan over medium-high heat. Add the butter and allow to melt. Add the cauliflower and curry. Allow to cook until softened and lightly golden, about 5-6 minutes. Add the potato and cayenne and stir to combine. Season with salt and pepper. Add the golden raisins and coconut milk, stir to combine and allow to simmer for 5 minutes or until slightly thickened. Add the cashews, season with salt and pepper, and remove from the heat. Allow to cool to room temperature before filling. For the Mint Yogurt Sauce: In a small bowl add the yogurt and mint and whisk to combine. Add the olive oil and season with salt and pepper. Whisk to combine and serve with samosas. Tips: 1. Make the samosa filling and dough the day before to reduce prep time. Bring the dough to room temperature before assembling the samosas. Dough will keep in the fridge for 1 week. 2. 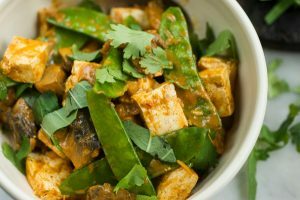 To toast the curry powder, place in a dry pan over medium-low heat until aromatic, about 2-3 minutes. 1. Remove the heads and shells from the shrimp, reserving both. Devein the shrimp and rinse them well. Season the shrimp with salt and refrigerate. 2. Place the shrimp heads and shells in a medium saucepan, add cold water to cover, and bring to a boil over medium heat. 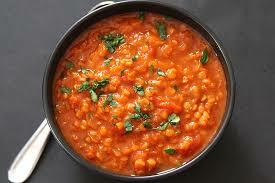 Reduce the heat and simmer until the liquid is reduced to 3 cups, 25 to 30 minutes. Strain the stock and set aside. 3. Heat the oil in a 4- to 6-quart pot over medium-high heat until shimmering. Add the sliced onions and cook, stirring occasionally, until translucent, 3 to 4 minutes. Add the garlic, turmeric, cumin, and pepper and cook until the garlic is lightly colored and the spices are fragrant, 2 to 3 minutes. 4. Add the reserved stock, the chile, tamarind paste, and vinegar and bring to a boil. Reduce the heat and simmer for 5 minutes. 5. Add the cauliflower and coconut milk and bring to a boil over medium-high heat. Season with salt. Reduce the heat and simmer gently until the cauliflower is just beginning to soften, 3 to 4 minutes. 6. Stir in the shrimp and cook until the shrimp are firm, 5 to 7 minutes. Remove and discard the serrano, if desired. Taste and adjust the seasoning. Serve hot. Sometimes I make this with fish instead of shrimp, using one 4- to 5-ounce (113- to 142-gram) halibut or fluke steak per person. (The steaks come from cutting a whole fish crosswise into 1/2 – to 1-inch-thick slices. It’s a very pretty cut, resulting in a nice oblong shape with a bone in the middle and the skin ringing the steak.) 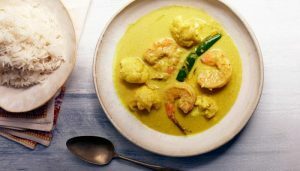 Use fish stock or plain water in place of the shrimp stock; the fish’s bones and skin add depth and richness to the curry, just as the shrimp shells do. Add the fish steaks where the recipe instructs you to add the shrimp and cook until the fish is opaque and flakes easily. In a large pot over medium heat, add the oil, garlic, ginger, and Thai red curry paste. Fry for 5 minutes, until fragrant. Add the chicken and cook for a couple minutes, just until the chicken turns opaque. Add the chicken broth, water, fish sauce, and coconut milk. Bring to a boil. At this point, taste the broth for salt and adjust seasoning accordingly (add salt if needed, or if it’s too salty, add a bit of water). 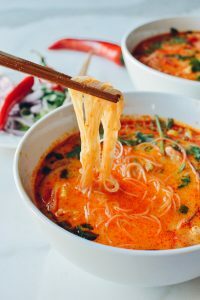 Pour the boiling soup over the dried vermicelli noodles in your serving bowls, add a squeeze of lime juice and your garnishes, and serve. The noodles will be ready to eat in a couple minutes. (Alternatively, you can add the noodles to the boiling broth to cook them, and then divide among serving bowls). Steaming the shellfish in a red curry sauce imparts just a hint of spice. Heat oil in a large skillet over medium-high heat. When oil shimmers, add garlic and ginger and saute until fragrant, about 1 minute. Stir curry paste into garlic and ginger and continue to cook 1 minute more. Add coconut milk to skillet and bring to a boil. Add mussels to skillet, cover, and cook just until mussels open, 2-3 minutes. 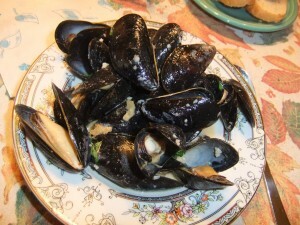 Transfer mussels to a large serving bowl with a slotted spoon. Pour coconut curry sauce over mussels, garnish with cilantro and lime and serve immediately.